Dominating the skyline of Los Gigantes, Acantilados de Los Gigantes (Cliffs of the Giants) offers a kind of view that inspires poets and painters on their crafts. Beyond being a stunning backdrop, Los Gigantes cliffs also protect the town from the trade winds. This ensures that the west of Tenerife enjoys the best climate on the island with the most hours of sunshine. Aside from the cliffs, Los Gigantes is also known for its picturesque marina and Playa de Los Gigantes, a natural black sand wonder. The submerged base of these cliffs is a haven for marine life, making this one of the island’s premier diving areas. Water activities such as snorkeling, kayaking, and sailing are also popular among tourists and locals alike. With the monumental cliffs that can be seen from most parts of the area, Los Gigantes is one of the most picturesque resort towns in Tenerife. Most of its scenic attractions are situated by the cliffs and the waters, and all for good reasons. Set in the foothills of the cliffs of Los Gigantes, Playa de Los Gigantes is dazzling in every corner. This small, black sand beach is the only one in town. Between the marina and the cliffs, the waves are gentle and perfect for a relaxing dip. The fine sand is also perfect for sand castle making, an activity that appeals to both young and old. Guests may lounge on the nearby bars and simply watch the sea and the world go by over some refreshing drinks. Standing more than 500 meters tall and bowing down to the Atlantic Ocean, Acantilados de Los Gigantes is impossible to miss. On a foggy day, the cliffs can appear to be up in the heaven. The cliffs radiate magnificence, and it’s no wonder why the Guanches believed that they had mystical powers. For a closer and unobstructed view, it would be best to appreciate the cliffs from Playa de Los Gigantes. Los Gigantes Marina showcases some of the finest sailing and fishing vessels in this part of Tenerife. The crafts dotting the calm, crystal clear waters are a delight to the eyes. The view is perfect for a relaxing stroll. Quaint restaurants and bars line the boardwalk, and visitors may enjoy food and drinks at a range of prices. Perched on a hill is Mirador Archipenque, a lookout point that offers the best view of Los Gigantes. The unobstructed view of the cliffs in all its glory is like no other. Aside from that, the other scenic spots such as the Marina and Playa de Los Gigantes are also visible. There is also a lovely cafe where visitors can just sit back, sip some coffee or tea, and savor the dazzling panorama. Although Los Gigantes is more laid-back than its neighboring cities, this town resort does not lack fun and exciting activities for all ages. Los Gigantes is an ideal place for some of the most thrilling water activities. See the gentle giants of the ocean as they swim and glide in their natural habitat with a fun-filled whale and dolphin watching. For those who are craving for more adrenaline pumping action, kayaking, banana boat ride, and jet ski are recommended. The town resort is also home to some of the most beautiful diving and snorkeling spots in Tenerife. Teeming with rich flora and fauna beneath the water surface, exploring the Los Gigantes’ ocean wonders is a treat to the senses. Atlantis-like basaltic rock formations, rays and all kinds of unique and wonderful fish await beneath the seas. Los Gigantes Diving Centre by the Marina offers lessons and equipment for novices as well as experienced divers. Aside from its great natural landscape, Los Gigantes is also blessed with one of the most glorious sunsets in Tenerife. The view of the sun kissing the horizon goodbye behind the nearby La Gomera Island is as romantic and phenomenal as it can be. The best thing to do is enjoy the scene over some refreshing drinks at one of the seaside bars. Los Gigantes is well connected by roads and the TITSA public transport system. The easiest way to get to the town is either by Tenerife South Airport/Reina Sofia Airport or by sailing into the resort’s marina. Visitors who will drive on their own may use this GPS coordinates to get to the town center: 28.2409° N, 16.8378° W.
Getting around Los Gigantes can be a challenge for some. The roads are narrow, with a one-way system operating throughout most of the town. Parking space is also hard to find especially in the town center and marina. The best way to go around the town resort is by foot. However, for visitors who wish to get up and down from Puerto Santiago, it is advisable to take a cab instead. Waking up to a stunning view of the giant cliffs and the sea is typical in Los Gigantes. Thanks to the town’s uphill hotels and apartments, it might just be what each visitor will get when staying in Los Gigantes. Situated on the hilly part of town and located just a couple of minutes from the beach is Royal Sun Resort. This hotel resort features an outdoor swimming pool and stylish rooms with impressive views of the coast. In the evening, the bars and restaurant in the property come to life with live acoustic entertainment. Located next to the Marina, Poblado Marinero offers a wonderful view of the cliffs and the iridescent sea. Its idyllic location, a few meters from the beach and within walking distance from the town center, makes it a favorite among tourists. The complex offers comfortable apartments, lovely garden, bar and restaurant and overall great environment for the whole family. Los Acantillados Apartment offers a sweeping, unobstructed views of the town, the sea, and the towering cliffs. Aside from its wonderful amenities, guests love the free private parking spaces that are hard to find. The tourist spots and the town center are also within walking distance from the complex. From traditional Canarian cuisines to delicious seafood fresh from the sea, Los Gigantes offers a great selection of gastronomic treats. Dining at El Rincon de Juan Carlos is a delight not only to the tasted buds but also the eyes. This cozy Michelin-starred restaurant offers traditional Canarian cuisine that goes well with the view of the cliffs and the resort town below. A top value menu includes such delights as succulent Gillardeau number three oysters with spicy coconut and galangal. Tipsy Terrace is not only one of the finest restaurants in Los Gigantes, but it also has one of the best show bars, best tennis centers and all-around venue for the whole family. The restaurant serves excellent food from breakfast to dinner, with garden terrace seating and indoor tables. In addition to the bar and restaurant, it features a heated swimming pool, 16-hole crazy golf course, and three tennis courts. Situated at the end of the marina, El Rincon De Antonio offers a relaxed and quiet ambiance as well as views overlooking the sea and the cliffs. Sample the delicious Spanish tapas and traditional Canarian black puddings for lunch. The colonial vibe and friendly staff are also noteworthy. El Pescador is known for its great selection of delicious fish and seafood dishes, and steak for anyone with an aversion to the fruits of the sea. Well-regarded by its patrons, this quaint restaurant is located in the heart of the town, beside the small plaza. Although Tenerife is known for the majestic Mount Teide, it’s not the only sky-high sight visitors may want to see on the island. Los Gigantes and its massive cliffs towering from the ocean creates a post-card perfect panorama that’s unique to the island. The views that this resort town creates are magical, especially during the sunset. It’s a photographer and an artist’s dream. 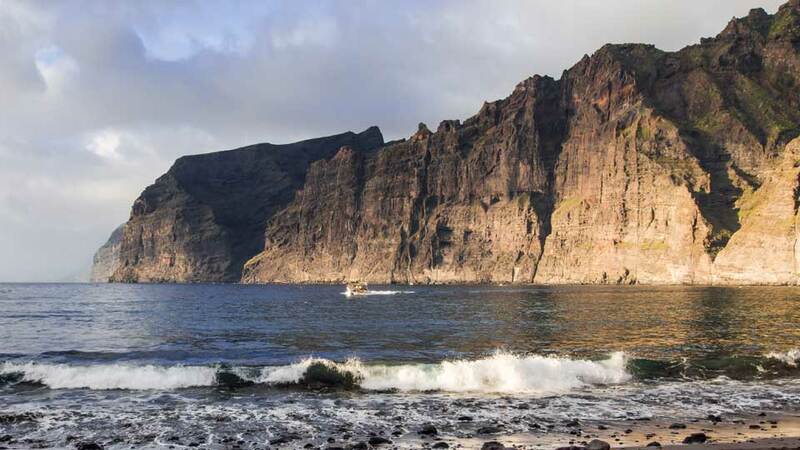 Indeed, natural scenery, the sunshine, and the sea are Los Gigantes’ greatest assets.